Hey friends, there is nothing like a cute puppy to make you feel good! This is my friend's family puppy and his name is Jake Wrigley! 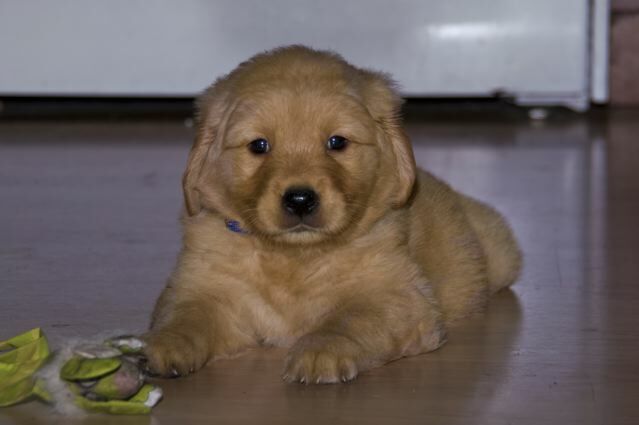 He is an eight week old Golden Retriever and extremely adorable! Awwwwww are you sure his last name isn't Wiggly? He looks like a tail wagger! Jake is such a cutie, I would love to cuddle that darling boy! You are so right.... he is adorable! Oh for sure, he IS just so adorable!!! Hi Jake. Goldens seem to do the khute puppy thing furry furry well! Oh Jake is so adorable!!!! Our mum would just love a puppy! Hello sweet Jake! Awwwww! Great to meet you - you really have the awwww cuteness factor down to a tee! Me and Charlie just can't resist! Jake Wrigley is just adorable! Thank you for the awwwwwwwwwwwwww's! Jake is absolutely adorable!!! Of so furry and sweet. Give him a pet for us next time you see him. How adorable is that little face!